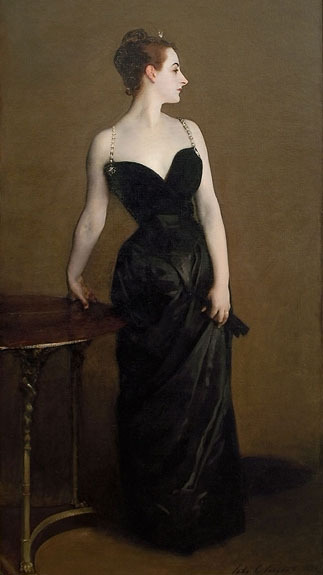 The famous 19th century portrait of Madame X by John Singer Sargent still has the same power to fascinate the viewer as when first exhibited in 1884. The initial presentation caused an uproar over the sexually suggestive pose that almost ruined the artist's career. Over 100 years later, the world of fashion obsessively returns to Madame X's seductive dress "that reveals and hides at the same time." Many designers, e.g., Galliano and Estevez, have either done interpretations of the famous gown or claimed inspiration for a collection from the portrait. Our stunning example from the talented Gianni Versace is one of the most imaginative "Madame X" dresses that I have seen. Versace captures the spirit of the infamous plunging neckline and decorative straps that just might slip off the shoulders. From there, he takes off with a modern interpretation as body-conscious as the original. 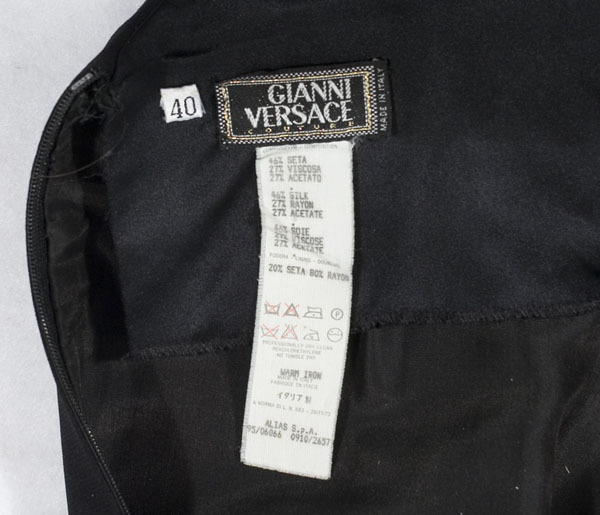 The Versace gown has a thigh-length, body hugging torso of heavy black crepe. The bias-cut, circular lower skirt is sheer chiffon, revealing the legs. 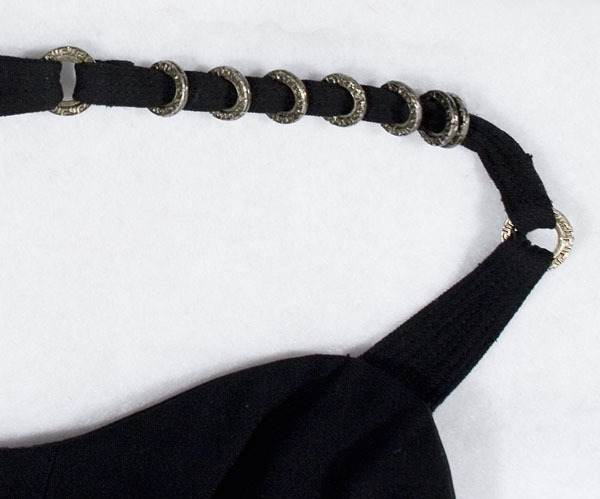 The decorative straps have Deco-style, silver-tone discs and top stitching. 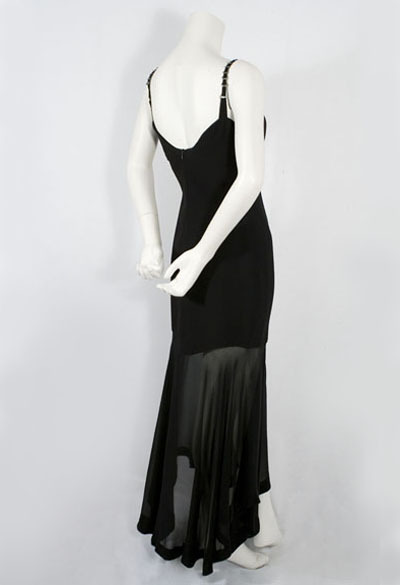 The torso is lined with black silk. 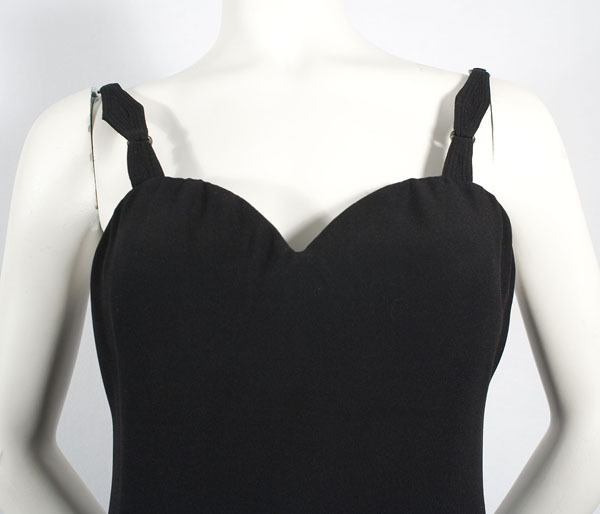 The bodice has a built-in bra. The gown closes in back with an invisible zipper. The size is marked 40. It measures: approximately 36" bust, 28" waist, 36" hip, and 45" center-front length.